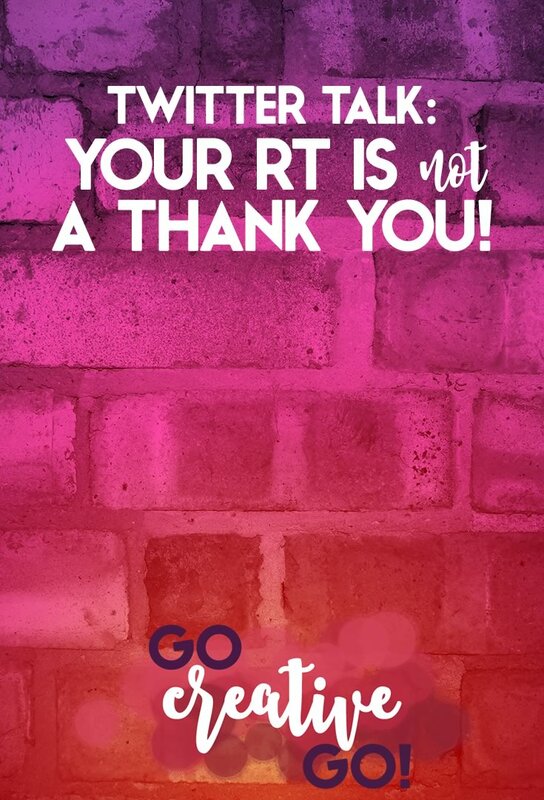 Twitter Talk: Your RT Is Not A Thank You! - Go Creative Go! It’s time for a little real talk about the way some marketers are conducting themselves on Twitter. All righty all of your content creators. I know you create content for a variety of reasons. But we all know that when we publish we cross our fingers and blow the fluff off a dandelion (just me?) hoping our social media circle will share that content. And then? It’s here where things can go a bit pear shaped and wonky. When you RT my share of your latest publish, I don’t feel appreciated. Instead I feel like you’re using my share as a mean to share your own content again without your audience getting on your for sharing it too often. But if you’re trying to build a valuable presence on a social media platform, I can’t understand this type of anti-social sharing. Wouldn’t a short, sweet and personalized thank you, in 140 characters or less, be more meaningful? It certainly means more to me. Now seriously, this kind of TY shows not only bad manners but also a poor understanding of the Twitter marketing. When you retweet the shares of your own content you alter the Influencers stats from Twitter Analytics and make the stats useless. The clicks you generate are added to the original poster and the Analytics stats become a mess that you cannot properly use anymore. Then what do I prefer? A share of my content. That’s how I say thank you every time that’s possible and appropriate. Agreed. But an immediate content share isn’t always possible. I appreciate the quick TY, but what I really appreciate and most look forward to is someone taking it to the next level. Even in less than 140 characters. Thanks, as always, for your spot-on analysis, Adrian. If You Publish, Make It Easy To Pass It On! Design Dilemma: Who’s The Website Really For?